Amazon’s Fire TV and Fire TV Stick have been best-sellers forever, and just about everyone who has one loves it. Of course there’s always room for improvement even with gadgets as awesome as Amazon’s Fire TVs. The Alexa voice remote is great, but wouldn’t it be even better if it packed a full QWERTY keyboard and backlighting? And wouldn’t it be even better than that if it also had programmable universal remote buttons that could control your TV so you don’t have to use any other remotes? 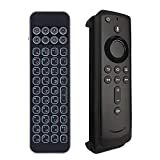 The iPazzPort Mini Bluetooth Keyboard with Infrared Learning Universal Remote Control kills both of those birds with one stone, and it’s only $24.99 on Amazon. [ Universal remote attachment]- 8 IR learning buttons let you control the basic functions of your TV (power, volume, channel, inputs etc), simple to program and use. Search “iPazzPortfans” on youtube to get video tutorials.Note: FIRE STICK REMOTE NOT INCLUDED. [iPazzPort Backlit Keyboard]- Mini bluetooth keyboard with LED backlit for convenient operation in dark room, Just need to press “FN+ Spacebar” to turn on/off.